If you’re looking for a new Windows 10 PC to carry around with you, then you have a pretty solid list of options to sort through. In fact, the process of choosing a new machine might seem overwhelming at times, given not only the many manufacturers but also the tremendous variety in basic form factors. You might be considering the detachable tablet 2-in-1 category if you want something that’s light, works as a traditional notebook, and is comfortable for casual consumption as well. If so, then you have a new option from affordable PC maker Chuwi, as Betanews reports. 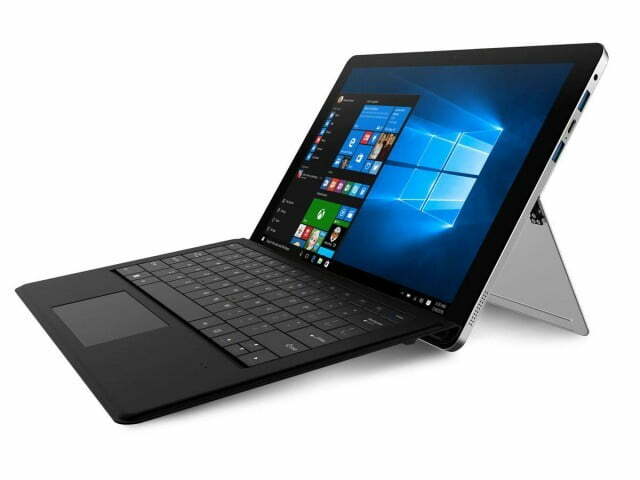 Chuwi is a Chinese company that is known for making low-priced PCs with reasonable quality, and it has jumped on the Windows 10 2-in-1 bandwagon created by Microsoft with its Surface line. The Chuwi Hi13 is a 13.5-inch detachable 2-in-1 that’s aimed at the Surface Book, and now the company is introducing its SurBook, a 12.3-inch tablet that’s laser focused on displacing Microsoft’s Surface Pro 4. While some other products area also offering Surface Pro 4 some competition, notably Asus with its Transformer Pro and the crowdsourced Eve V, Chuwi’s approach is to attack Microsoft’s offering at the low end. Rather than packing in the latest seventh-generation Intel Core processors, Chuwi is equipping the Intel Apollo Lake N3450 processor to shave off some cost. An odd 6GB of RAM configuration and more limited 128GB of SSD storage rounds out the entry-level specifications. At the same time, the SurBook does offer up a similar 3:2 12.3-inch display with the same 2,736 x 1,834 resolution as the Surface Pro. It also sports a similar kickstand for a wide range of use cases. Front and rear cameras and a USB Type-C port round out the machine’s components, and Chuwi is offering a detachable keyboard and active pen with 1,024 levels of pressure sensitivity. Chuwi hasn’t yet announced pricing or availability, and indeed it’s looking to crowdsource the SurBook’s development and distribution via IndieGoGo. If you’ve been hoping for a new Windows 10 detachable tablet 2-in-1 machine with a price point that’s a little more down to Earth, then you’ll want to keep your eye on the Chuwi SurBook. Given Microsoft’s delay in announcing its Surface Pro 4 replacement, it seems like you’ll have a little flexibility in making your decision.